Learn to make these crisp, golden potato pancakes. Latkes—fried, onion-laced shredded potato patties—are synonymous with Hanukkah, because the frying oil is a reminder of the miraculous vial of oil that gave eight days of light. But when I was growing up, my family made latkes for any special occasion, when everyone was around to help with the grating of potatoes and the dicing of onions. Then we’d all gather at the table and smear our fresh, hot latkes with sour cream and apple sauce, the two must-have accompaniments. There are two distinct types of latkes—thick ones with a crisp, golden exterior and a soft starchy center, and thin ones that are super crunchy, with distinct strands of potato and crackly, lacy edges. My family tradition is the latter. The difference comes down, in large part, to how you shred the potatoes. While much faster for making large quantities, using a food processor with the shredding disk creates thinner strands that can fall apart. I hand-grate the potatoes to make sturdy shreds. Then I bind the latkes together with starch reserved from soaking the grated potatoes—it crisps better than the flour or matzoh meal called for in other recipes. These small extra steps are what make these latkes special enough for any occasion, holiday or not. Want more latkes? 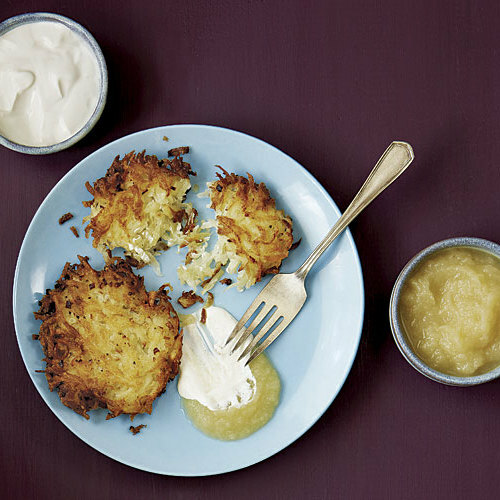 View a slideshow of our favorite latke recipes—including classics like this one—as well as a few modern and inventive twists. 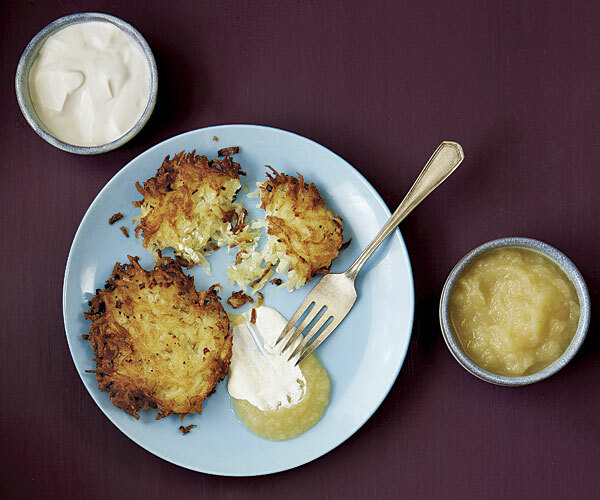 Use starchy russet (baking) potatoes for latkes that hold together. In addition to acting as a binder, the starch gets nice and crunchy when fried. Grate the potatoes by hand. Use the large holes on a box grater for uniform and distinct strands that won’t turn to mush during cooking. Soak the potatoes in cold water. 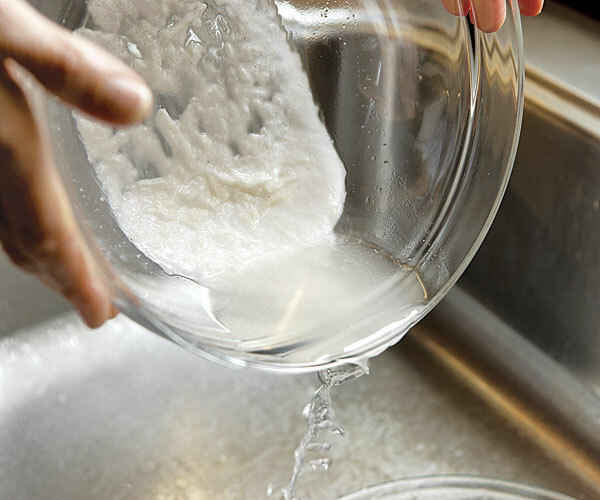 Not only does this step prevent discoloring, it also saves the potato starch—instead of going down the drain when you squeeze the potatoes, it will settle to the bottom of the bowl. Then you can pour off the water, as shown above right, and return the starch to the potatoes after squeezing them. Squeeze the liquid from the potatoes. 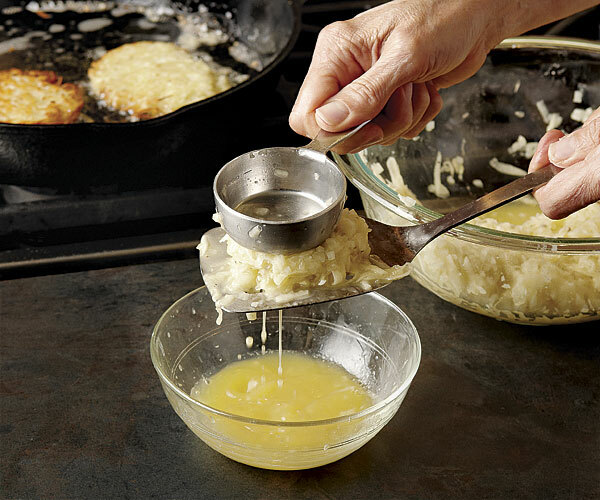 Excess liquid creates steam in the skillet, making soggy latkes. Plus, dry potatoes will hold together better. Be gentle with shredded potatoes. Mix them with your hands to keep the shreds intact. Give the latkes a good press before putting them in the frying pan. Shape the latkes on a slotted spatula and then press to flatten them. This helps drain any remaining liquid to prevent spattering and steaming.